Fontaine-de-Vaucluse is a commune in the Vaucluse département in Provence-Alpes-Cotes d’Azur region, best known for its phenomenal spring water. We came here in search of the source of the Sorgue River and found a beautiful village aflush with water from its mysterious spring. To quote the Rime of the Ancient Mariner there was literally water, water, everywhere (but fortunately, lots to drink!)! The village was previously called Vaucluse or Vallis Clausa (closed valley). It was only in 1946 that its name was changed to Fontaine-de-Vaucluse. The commune has just over 600 inhabitants, however it’s fountain is the biggest spring in France. It is also said to be the fifth largest in the world based on volume of water. Its annual flow is a staggering 630 million cubic metres. This translates to over 1 million cubic metres per inhabitant or 1 billion litres of water. March is when the water flow peaks and it lasts for about five weeks. Where this water comes from and how it surges have been the subject of extensive studies. In spite of the hundreds of studies and books written about it, the spring is still somewhat of a mystery. From the Tourist office, we, and most other visitors, walked along the Chemin de la Fontaine which follows La Sorgue river all the way to the spring itself, the actual Fontaine de Vaucluse. It’s a pleasant walk as the road follows the tree-lined refreshing emerald green river to its source. At the foot of a steep cliff, the source of the Sorgue spring can be seen in a huge cave. During the peak of the spring flow, water gushes out of this outlet and finds its way all the way to Avignon and elsewhere. We visited in summer, so unfortunately there was not much water to be seen. But as you can see Tony pointing to the markers on the side of the cave, they show how high the water levels got to during the height of the spring flows. Water gushing out of this source be must be quite a sight. Since antiquity, the Sorgue River has played a key role in the economy and wealth creation of the region. The Phocaeans of Massalia, and later the Romans, used it as a trade route. In the 16th century, the commune prospered from the paper-making industry. There were seven paper mills in the village. A giant waterwheel at the paper milling museum shows some of the equipment used in the ancient paper mills. These days the water is used for power generation and drinking water. To our greatest surprise Emperor Hadrian was in town and he appeared from the Town Hall, flanked by his fearsome Praetorian Guard (well, a few centurions and standard bearers). The Romans were in Provence for a few centuries, and many of their constructions still exist today in Nimes, Arles, Avignon, etc. Emperor Hadrian addressed the crowd. Whether he was proclaiming another war or announcing the construction of another huge monument, I didn’t get what he said. At the end of the speech the Emperor and his centurions marched along the Chemin de la Fontaine towards the spring. Not wanting to miss the chance of walking alongside a Roman emperor, we tagged along. I even got to pose next to Emperor Hadrian, as you’ll see in Tony’s video. In the middle of the village square stands a column to mark the 500th anniversary of the birth of Petrarch, the celebrated Italian poet and scholar. The Sorgue was a source of inspiration for Petrarch and he wrote about it in his songs. The column was originally by the Athenaeum of Vaucluse near the source of the Sorgue but was transferred to this square in 1827. The Petrarch Museum in the village has information about Fontaine-de-Vaucluse’s famous resident. The museum stands on the site where Petrarch’s house used to be. On the road to the source of the Sorgue there are some marble plaques commemorating Petrarch. He settled in Fontaine de Vaucluse in 1337 where he wrote some of his most famous works. In 1353 he left Vaucluse to return to Italy. Another of Fontaine de Vaucluse’s attractions is the ruins of the Bishop’s Castle. The castle stands above the village and gives evidence of the existence of the village back to the Middle-Ages when the Bishops of Cavaillon ruled in the region. The castle belonged to Philippe de Cabassolle. He built his castle on the site of the old fortress when he was elected Bishop of Cavaillon in 1334. Philippe de Cabassolle was a close friend of Petrarch and was probably the reason why Petrarch moved to Vaucluse in 1339. Shortly after Petrarch’s departure, the village fell victim to a band of looters and plunderers who entered the village and set it on fire. Petrarch’s home was destroyed, however the fortress was spared. It is worthwhile to visit the site if you don’t mind some climbing. There are no safety railings and the “Zone Dangereuse” sign by the commune authorities warns that you climb at your own risk. From the top of the castle we had great views of the village, its river and the surrounding areas. Fontaine-de-Vaucluse may be a small village, but there are many things to see and do, including several museums. The Church Notre Dame and Saint-Véran was built by the monks on the site of an ancient sanctuary dedicated to a pagan god of waters. If you’re intending to stay in Fontaine-de-Vaucluse itself, you should book your accommodation early as there are not many hotels in town. 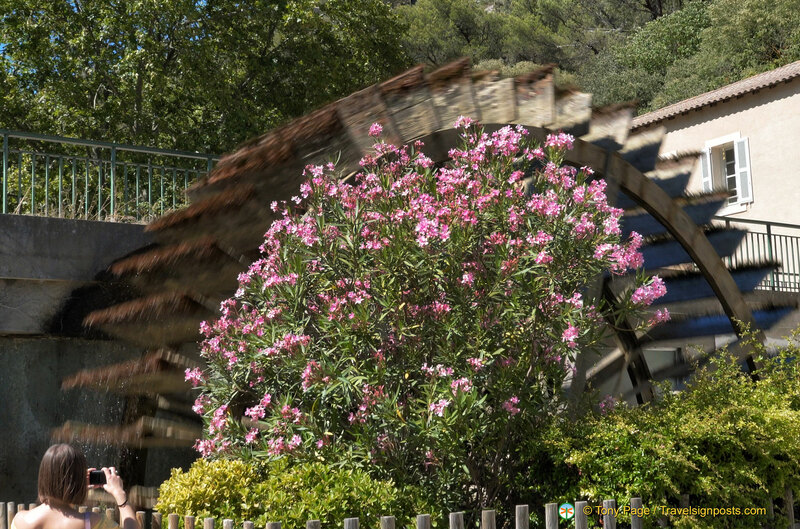 See the list of Fontaine-de-Vaucluse hotels here. Fontaine de Vaucluse is very much a touristy destination. In the centre of village, and along the Chemin de la Fontaine, there are many cafes and restaurants where you can have a snack or meal and admire the spring water flowing. Fontaine-de-Vaucluse is about 8 km east of Isle-sur-la-Sorgue where we were based. The local bus number 6 stops right outside the village and it is an easy stroll in. If driving, there are a couple of car parks, just at the entrance to the village.